I always tell people “I am naturally caffeinated”. I have three teenagers, I run a business and a household on my own and I’m always actively doing something. Sometimes at night I can hardly sleep. One thing I have noticed after years of consulting with hundreds of clients is that one of the main problems we have in today’s society is consumption of too much caffeine. However, I know how hard it is to avoid caffeine! And with the weather getting colder and colder I am certainly reaching for a comforting hot tea more frequently and I’ll bet you are too. The last thing we need is some extra caffeine to go with our warm, soothing, healing cup of tea. However, sometimes it is hard to avoid – even in our favorite teas. I have some dear friends who have given me tea as gifts and they are such lovely tempting flavors, but they all contain caffeine. However, there IS a solution. This solution also works if you accidentally pick up that caffeinated tea at the store instead of decaf (I did that with some Earl Grey once) or if your favorite tea that you want to enjoy a cup of in the evening just happens to be the one with caffeine in it. The solution is to make your own decaf tea. To do this – put the tea bag in the cup, pour boiling water over this, let steep 20 seconds. Pour off the hot water and then pour on new water. The tea still maintains its healing qualities and taste but is no longer caffeinated. 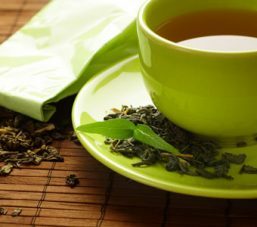 This is especially important for Green Tea as it has almost as much caffeine as coffee! And while you are watching your caffeine intake – remember – decaf coffee has as much caffeine as a cup of caffeinated tea and dark chocolate has a significant amount of caffeine as well. Many people also report that foods with MSG in it (Pizza Hut Pizza, many fast food soups, salad dressings, many other items) affect them in the same way caffeine does. Here’s to a more relaxed day and a peaceful night’s sleep!